I do not sell this one on eBay yet. Buy direct for $70 + shipping of $10 within the US or $23 outside. This wireless remote adapter plugs into the Parallel Remote connector on the deck and controls the standard 5 transport functions: Play, Stop, F.F., Rewind and Record. 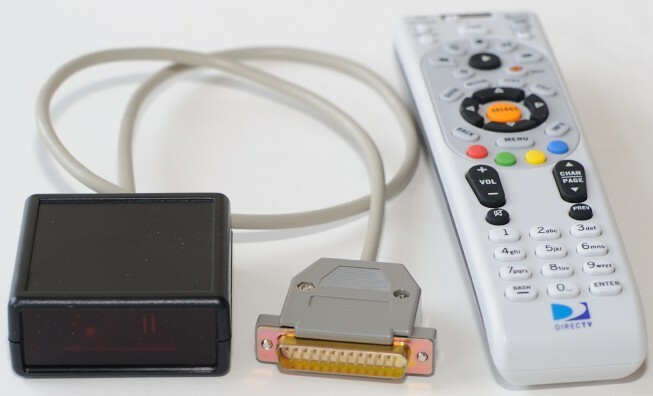 All functions can be controlled using any universal remote programmed for the proper Sony VCR code. To program the RCA remote press and hold the Code Search button until the red light comes on. Release the Code Search button and momentarily press the VCR button then enter the 3 digit code from the table above (default is 119). The red light should blink after each keypress and go out after the last digit is entered. Press the VCR button and press one of the transport control buttons (PLAY, STOP, FF, REW or REC). The light on the front of the remote adapter should blink off momentarily. If the light does not blink off try reprogramming the remote or check the state of the jumpers inside the remote adapter. On the RCA remotes the REC button needs to be pressed twice to activate record.